A fishing boat named "Bromley's Venture" docked in Conche Harbour in Newfoundland, Canada is ready for its daily trip into the waters to catch as many crabs as they can. Crab fishing is a way of life for many of the local residents who reside in Conche Harbour and their fishing boats must be prepared every day with stacks of crab pots so the fishermen can leave early in the morning. Crab pots on the deck of 'Bromley's Venture' a crab fishing boat in Conche Harbour unable to leave the dock because of pack ice, Conche, French Shore, Northern Peninsula, Great Northern Peninsula, Viking Trail, Newfoundland, Canada. 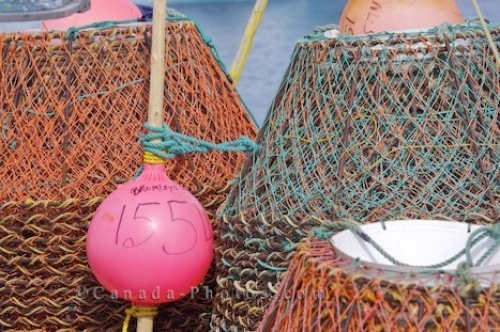 Picture of the crab pots on a fishing boat prepared for the fishermen in Conche Harbour in Newfoundland, Canada.